Everyone’s teeth suffer some degree of staining or dulling due to coffee, cola, tea, wine, tobacco, or the effects of aging. At Westlake Hills Dentistry we know a bright white smile can make you feel more confident and attractive. That is why we offer the best teeth whitening methods available in our Austin area office. Dr. Ho feels the single most effective method of getting teeth their whitest is the use of a prescription strength teeth whitening solution. This method has been shown to be more effective than laser teeth whitening, in office chair side teeth whitening, over-the-counter teeth whitening systems, or any teeth whitening toothpaste. Lab studies, such as those performed by Reality Labs and the Clinical Research Association (the Consumer Reports for dentistry), have shown that laser and light-assisted teeth whitening such as Zoom had no effect on whitening results. Teeth are made whiter by the whitening solutions applied to them; the light is just for show and has no effect on the whitening results. In fact the light just dehydrates your teeth giving them a very temporary psuedo-whitening affect. At our office in Austin, Texas, we use a prescription-strength teeth whitening solution that lets you determine your results. Depending on the number of applications you choose, you can whiten your teeth from one to eight shades. Also, your custom molded tray will keep the home teeth whitening solution in close contact with your teeth. This prevents the teeth whitening solution from being diluted by saliva, and protects your gums from irritation. Other teeth whitening methods are simply not as effective. First we begin by creating a custom mold of your teeth. 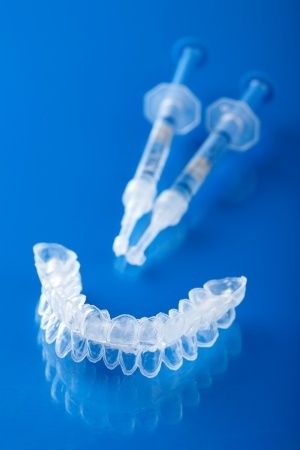 This teeth whitening mold or tray is the device which allows the prescription strength gel to make and keep contact with your teeth. The gel whitens your teeth by lightening the discoloration of the enamel and dentin. The longer the teeth whitening gel is in contact with your teeth, the whiter your teeth will be. Day White: This is a thirty minute to one hour application twice a day. Most people wear the teeth whitening tray while reading, watching television, or while doing other leisure activities. It is easy and convenient. Night White: An overnight application while you sleep. Simply apply the gel, pop the trays in your mouth, and your teeth are lightened as you enjoy a restful night of sleep. You determine the degree of whiteness by how often you use the solution. Most people find their teeth have achieved the desired level of whiteness in about two weeks. Touch ups are needed once or twice a year. You can keep and use your trays between touch ups as they will last for a very long time with proper care. One of the benefits of this method of teeth whitening is that you can keep your teeth white over a long period of time. 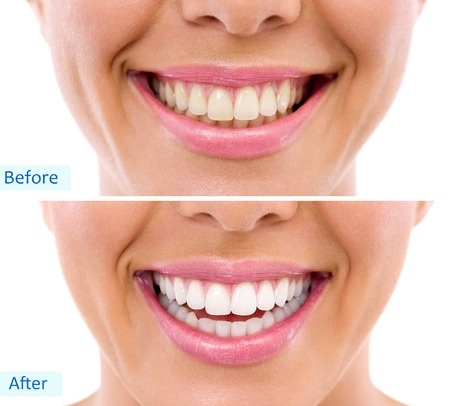 You can obtain the teeth whitening solution for touch ups at our Austin office at a very reasonable cost. Contact Westlake Hills Dentistry in Austin, Texas to learn more about teeth whitening and how it can be used in combination with other aesthetic dental solutions such as porcelain veneers, composite bonding, tooth-colored fillings, and Invisalign® clear braces.